Is the tub hot yet? Know precisely with this ingenious remote display/alarm system. Remote transmitter beams constant readings to the base unit up to 75' away. Indoor base unit's alarm sounds when your preset temp is reached. 6 AAA batteries required. • Floating Foam Cover helps maintain water temperature by greatly reducing heat loss from the water's surface — the biggest source of heat loss. Use alone or in conjunction with wood/aluminum cover to further slow heat loss and prevent debris from getting in your tub. • Paddle is high quality, all wood. Stirs the water, keeping temperatures uniform from top to bottom. • Stainless Steel Stove Pipe replaces the standard galvanized pipe. No rust, no corrosion. • Stainless Steel Spark Arrestor stops flying sparks. Particularly valuable in dry or windy areas. • Drain Kit makes it easy to empty your tub. PVC with brass adapter for garden hose. Includes PVC fitting for our 1-1/2" Drain Line. • 1-1/2" Drain Line is 50' of strong, flexible 1-1/2" diam. vinyl tubing. Drains big volumes fast. Rolls flat for compact storage. Drain Kit required. • Leaf Skimmer is sturdy nylon mesh with a plastic handle. Convenient way to scoop floating and submerged leaves and debris from your hot tub. • Stainless Steel Hoops are identical to our standard steel hoops but will look great and provide non-staining beauty to your tub for life. • Spa Pad is a non-chlorine/bromine tub sanitizer. The pad contains zinc and copper — minerals that kill bacteria and keep your water odor-free and crystal clear. Incredibly easy to use and has received 100% positive reports from our customers. 12" x 14", lasts about a year. 100% CHLORINE FREE! • Chemical Starter Kit gives you everything you need to monitor and control tub chemistry and sanitation. Instructions and video included. • Filter Cleaner concentrated solution removes dirt, debris, oil, grease, soap, and minerals from your filters. • Box Steps follow the tub's rounded contour. The short step is sufficient 3' high tubs when placed adjacent to the highest interior bench. Note that 4' tubs require both the short AND tall steps . Short Box Step: 15" h. Tall Box Step: 30" h. Light assembly required. These steps do not have a hand rail, so if steadiness/safety is important consider the stairs instead. • Stairs have 3, 11"-deep steps and a hand rail for easy entry. One size fits all our hot tubs. Light assembly required. • Benches for wood-fired hot tubs come in sets of 3. Staggered heights so you snuggle in chin-deep to warm up or perch chest deep to cool down. Western Red Cedar. Light assembly required. 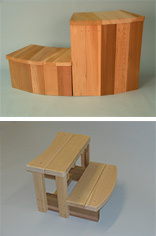 • Benches for Gas & Electric-heated tubs come in sets of 5 for "full circle" seating. Since gas/electric heaters are located outside the tub, benches go all around the tub's interior.